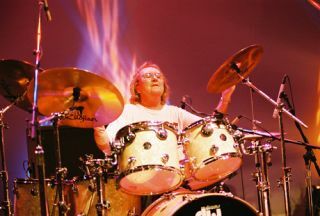 On 9 July Mitch Mitchell would have celebrated his 63rd birthday. The hugely-revered drummer - best known for his time with the Jimi Hendrix Experience - passed away in 2008 and his name remains synonymous with the drumming greats of the last 50 years. To honour his legacy we have picked out our favourite moments of Mitch's illustrious back catalogue to form his Career In Beats. 'Fire' is a prime example of Mitch's skills. A performance to get very excited about, even if the majority of the crowd in this live video from 1969 do seem a tad subdued (Bar the fantastic air drummer at 2:15). An undoubtedly intimate performance, and a slow burner of a track, but Mitchell still oozes class in this live clip. While the likes of 'Fire' show off his chops, 'The Wind Cries Mary' demonstrates just what can be done with unshakably solid hi-hat work and a simple verse-ending fill. Kicking off with snare triplets into a hip-shaking groove, 'Manic Depression' sees Mitch display his ability to not just back Jimi's virtuoso guitar work, but add to it with his own snare expertise. Filled with jaw-dropping snare and tom breaks, here Mitch shows how to lay down a rock steady 3/4 beat. Well, we couldn't really list Mitch's Career In Beats without this one, could we? A stone cold classic from start to finish. Mitch rocks a relatively restrained beat, but he still manages to stamp his class throughout the track. Check out the studio version above to see what we mean. About as tight as you can get, this is a sublime example of Mitch's soloing prowess. As he unleashes all manner of triplets and snare rolls, Jimi prepares to burst into a solo of his own, which Mitch matches with an authoritative ride-led beat.